It is pretty big, so I am thinking that you might have seen "my chicken". 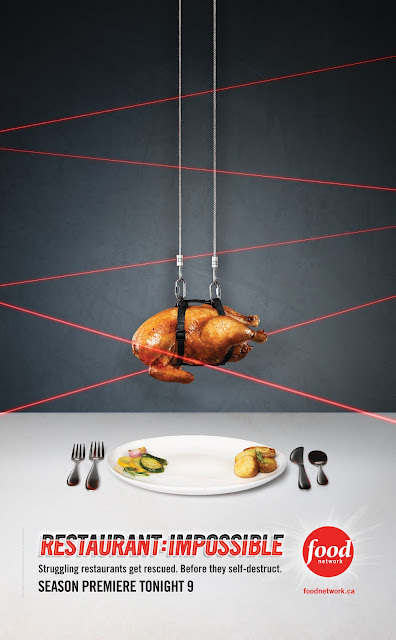 The one used in print ads, tv commercials and large billboards for the Food Network's newest show called Restaurant Impossible? For the past week I have been working in a small mid-town catering company which operates out of a commercial kitchen above the commercial kitchen of a restaurant. The cast from "Glee" was lunching there on Friday as it turns out. 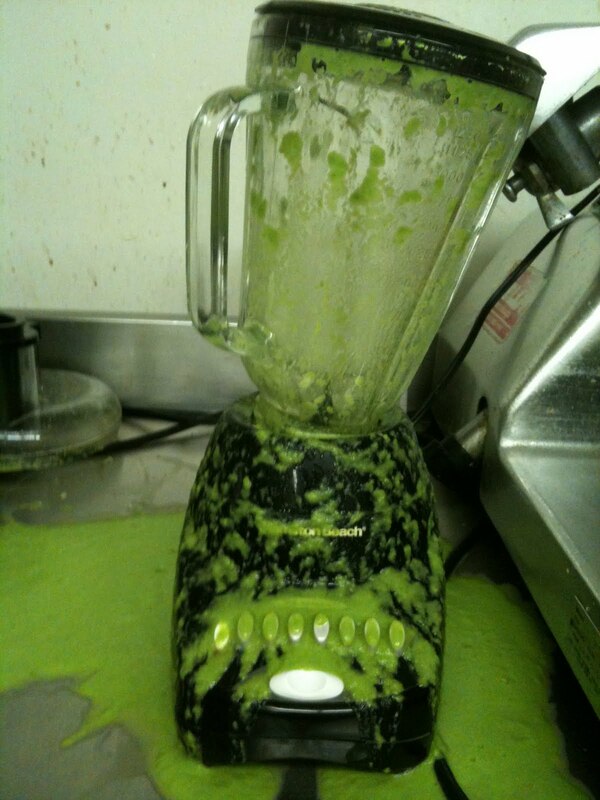 In hind sight, always check that the blender blade and mechanism is properly attached after every use! I have a fairly sizeable cookbook collection - including of course the one written* by mom, along with food magazines and the occasional pamphlet and scrawled out recipe. 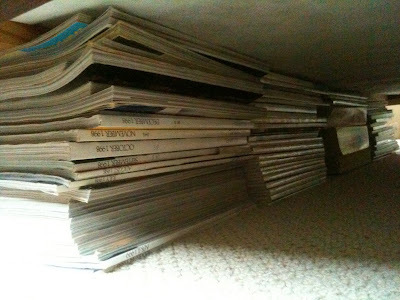 I also confess to not wanting to chuck or recycle the vintage Gourmet magazines in my possession so when the movers who delivered our new bed told me that I had to support the wooden slats that hold up the mattress - I had my answer and I have never slept better. The area dedicated to cookbooks in the kitchen is packed tight, very tight - but when a friend recently gave me a copy of Thomas Keller's The French Laundry Cookbook - I knew that another wooden slat was going to be supported under my bed. Out with some other less frequented books in order to make room to new star in the collection. The book is truly beautiful, the images are gorgeous, inspirational and yes, I do want to attempt their recipes. Not only does the book draw you in with the sensual images, but it is peppered with anecdotes and tidbits that are both useful and informative. My sister and brother-in-law will be in the land of The French Laundry next month along with another couple, both celebrating the quarter century wedding anniversary. When they knew their dates, they began to plan for the restaurant itinerary. The French Laundry accepts reservations two months out, no exceptions. Knowing this, my sister and her friend both attempted to contact the restaurant exactly two months out from their time in Nappa from their respective home by calling and by emailing. Twenty minutes after the lines were opened they got through - and their names are now on the wait list.... Good luck with that sis, and thank you for the book JM! This cookbook was a wedding gift in 1962, from a recent U.ofT. Household Science Grad. As a collector of cookbooks for many years, I still find it my best resource for numerous topics, often getting calls, from both new and experienced cooks, looking for info. I recently tried to purchase a copy at an estate auction, but was outbid. Our youngest (of 3) daughters, all of whom learned to cook from this book, has requested it, as she is soon to be married. I am delighted that it is still available for me to purchase for her, as I cannot yet part with mine. I received this cookbook as a gift when I was first married in 1955. I had no idea how to prepare a basic meal of meat and vegetables but I learned very quickly thanks to the basic, simple instructions in the Canadian Cookbook. This book is a must for the novice cook as it covers everything from how to set a table, to cooking for a crowd. I have yet to find another cookbook that measures up to this one. Several years ago I gave a copy of this book to a new bride and she still thanks me for it. She says she doesn't know how she would have managed meal preparation without it. I am so pleased that the Canadian Cookbook is still available as my copy is falling apart and needs to be replaced. As far as I am concerned, this is the ONLY cookbook for the basic cook and no home should be without the Canadian Cookbook. I thought that I would follow up on a thought or two and some uses of products mentioned in previous blog postings. 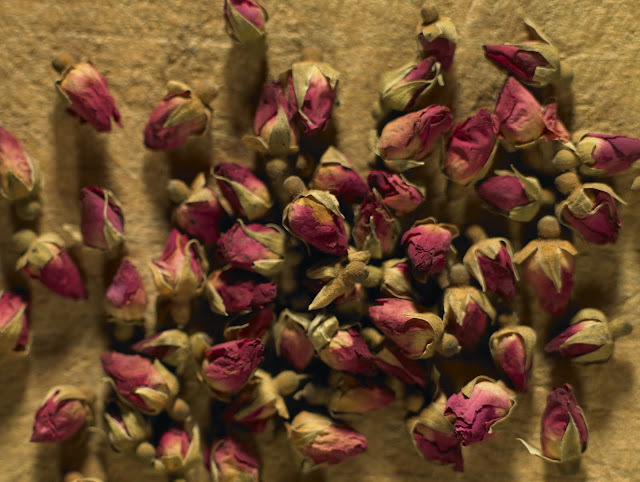 First, the beautiful tiny dried roses. Bosc pears were on sale recently, loaded up on them and I decided to poach some of them. I typically make a simple sugar of 1l of water and 1.5 cups of sugar, throw in a split vanilla bean, some lemon peel strips and we are good to go. 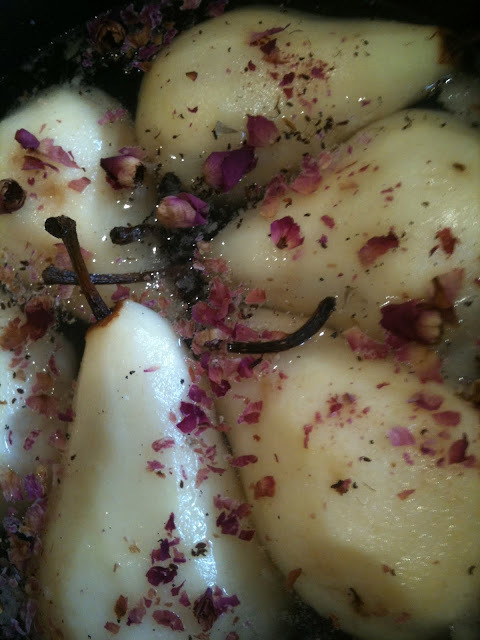 This time, I added the petals of about ten tiny dried roses - which infused a lovely floral scent and taste the to pears. They were delicious just like that, simple and understated. A friend spotted something that looks like tiffins at a large (ie. sanitized) organic downtown grocery store and sent me a photo. They appear to be only one level (what is that?) and cost about $30+ adding insult to injury. Go ethnic! Go to an east Indian neighbourhood, or grocery store - they are sure to have them. Ideally, buy a stainless steel one and not aluminium. My personal preference, and they don't "ding" as much. Contrary to what many people think, stainless steel CAN GO IN THE MICROWAVE - only stainless though and in fact the lining of many microwave ovens and is stainless steel. Go ahead and take a peak in your oven now - the interior might be stainless. Chef Michael Olson taught me that trick when I was assisting him, and his Chef wife Anna Olson, at a cooking school. My sons have found a new use for chick peas: ammo. They received Vermont whittled slingshots from their sister for Christmas last year. Since then they have been helping themselves to my dry chick pea stash in order to take aim at: squirrels, racoons, pigeons and any other urban vermin that dares enter our back yard - that is if our dog doesn't go for them first. Our neighbours are no doubt finding chick peas in their yards and I have found a few that went through the washing machine from my son's pockets. I am happy to report that nothing and no-one has been seriously injured, maimed or broken since the slingshots arrived. Talk about the ultimate reusable lunch pail! 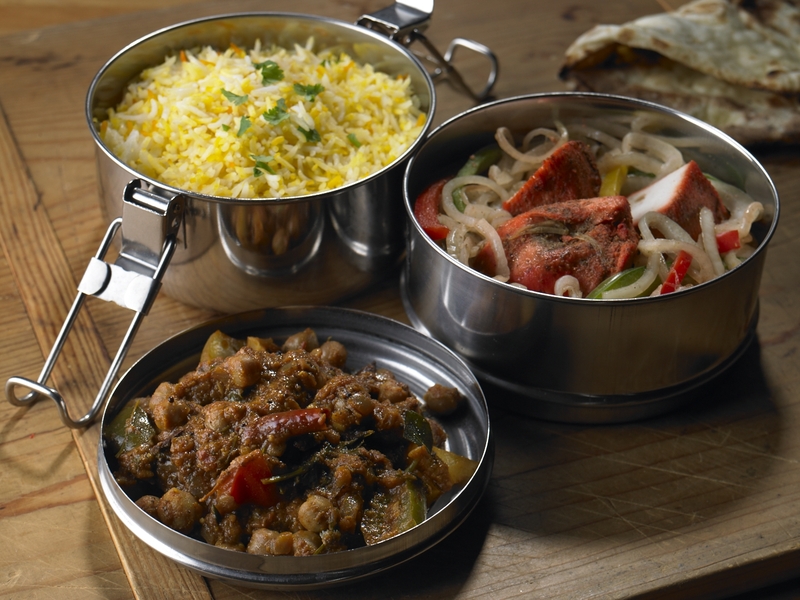 Stainless steel tiffins are the carrying device and food container all in one. I have one, made in Mumbai, India and just the right size for someone with a healthy appetite, or for sharing with someone who you really care about. A friend of ours of Indian descent brought us a gorgeous lamb biryani for dinner about two months ago, and it was in a four level tiffin! I was so thrilled: delicious, hot dinner made and delivered and all in fantastic containers! I also appreciate that they are not plastic, have stack-ability and the closing and carrying mechanism are all in one - brilliant. Perhaps I will pick up a few more so that each of the three kids can have one for their lunch bag. The foam quilted plastic bags available everywhere just aren't doing it for me. They typically tear, the zippers break and I am sure that the lining is a breeding ground for all kinds of interesting science experiments - seeing that it is challenging to clean properly. Here's to all of us using tiffins, packed full of our favourite foods - Indian or not. Enjoy, FF. OK, I admit it, I have food prejudices - and some of them I am perfectly happy to maintain. Food colourings rank very high, as do highly processed foods, some foods from certain countries of origin and excessively packaged foods - especially for home consumption. We have three healthy and growing children, and I am aware of how much recycling, garbage and compost we produce though I think that we are really quite good. Many schools ask that parents pack lunches in reusable containers and everything is "boomeranged" - ie sent back home - whether it is consumed or not. Great idea, parents can actually see what it is that junior is or is not eating, and all garbage and waste is put into the home's system and not the school's. 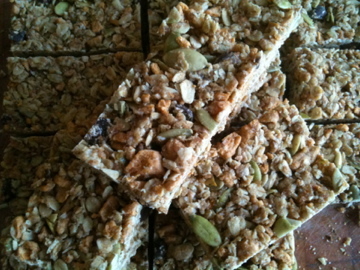 I used to buy (gasp) packaged granola bars before I got this recipe, it is from a local caterer where I have worked - however I have tweaked it, as I often do, and reduced the amount of chocolate. Yes, there is such a thing as too much chocolate, this variation gives just the right hit without turning the bars into a confection. We do not have nut allergies in our family, and I can only imagine how scary it would be to have a child who has to be on the lookout at all times. I never put nuts into granola bars that I prepare for the kids' school lunches - but we enjoy them in our weekend version. Preheat oven to 325 F. Line a 9x13" pan or two 8x8" pans with parchment paper. Mix all ingredients into kitchen mixer, and using the paddle attachment, mix until well combined. Place mixture into prepared pans, press down and into corners. Bake 18 - 22 minutes, until slightly puffed and golden. Let cool before cutting. I make these things so often I could make them in my sleep, I switch up what I put in them based on what I have in the pantry and the cereal cupboard. The remnants of that big box of bran cereal that was on sale? In it goes, two spoonfuls of golden raisins? and so on. Enjoy, FF. There are times when I impulsively purchase interesting food products and only figure out what to do with them well after. I love these tiny roses, the first time that I came across them was at the large outdoor market in Nice, France. 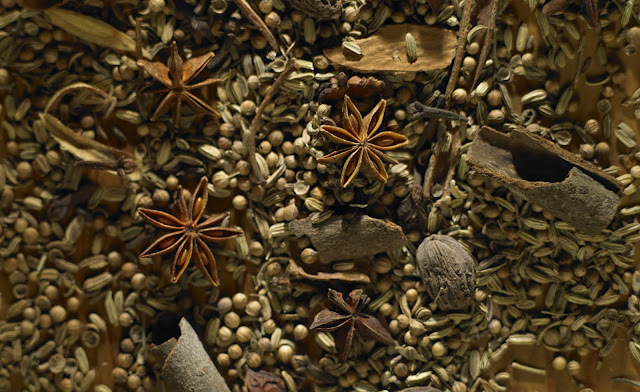 I bought them, brought them home, admired them and ground some of them up to use as a finishing flavour in a lamb stew. I recently came across the ones in the above photo at a Chinese grocery store in Toronto and had to buy them for their beauty alone, not to mention that they are a steal at $3.99. I have since learned that they are often in steeped in hot water and made into a floral herbal tea. I have made a walnut baklava flavoured with cardamom and rose water and I am thinking that these roses could be a lovely enhancement to it. I am also curious about experimenting with a rose flavoured macaron and using crumbled petals in the almond meringue cookie. To be continued. 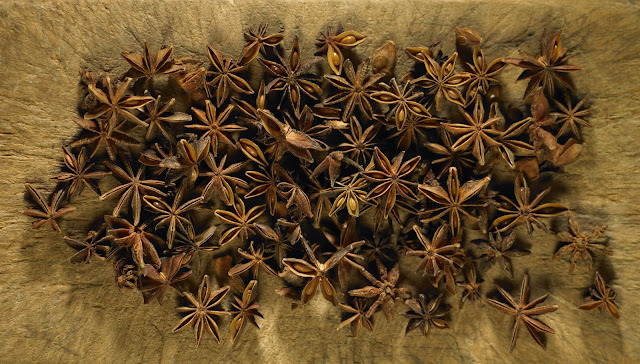 Star anise is another visually interesting spice. It has a distinctive anise or liquorice flavour and is used in many ways including Indian biryani dishes, in the making of Chinese "Five Spice" spicing (along with cloves, cinnamon, fennel and pepper) and with other ingredients for the flavouring in Pho, see below.